Eating habits form early. Unfortunately, they are hard to break. The problem is we over eat for many different reasons. We eat when we are hungry; we stop when we are full. But sometimes we eat even when we aren’t really hungry. When there is food around us during the night, or during a party, we graze. We eat to socialize, we eat for religious reasons, and we eat for emotional reasons. Problem is, while we eat, do we keep track of the calories? What if we spent our money like the way we eat? How much money would you allow yourself to spend each day? My guess is probably not an unlimited amount? In the mood to just whimsically buy something, so you just spend? Socializing at a party, so you just buy something no matter the price? Sad or depressed or angry, so you buy something? We would all go broke! Instead, we budget ourselves carefully based on what we know we can afford. So why don’t we do this with food? The answer is simple. We never learned the currency: the calorie. The average person should not be eating any more than 2000 – 2500 calories per day, depending on how many calories that person burns daily. And diabetics should be eating no more than 1800 calories a day. How many calories a day do you eat? I bet you do not know. The problem is until you do know this number, it will be very hard for you to lose weight, and even harder to maintain that weight loss. To begin your weight loss journey, we encourage you to explore the seven step approach to weight loss. This process can help you determine if you are a candidate for bariatric surgery. The first step for anyone who wants to lose weight is to record the number of calories you eat each day. Record this number for 3 days in a row, and then divide by 3. This will give you an average calorie / day that you ingest. If this number is higher than 2000, then chances are that by cutting caloric intake you can lose weight. The average person will lose one pound when they eliminate 3500 calories from their normal intake. That means if the average person decreased their intake by 500 calories per day, they could lose 1 pound each week. Weight loss plateaus when the caloric intake equals calories burned. (This is why exercise helps, because exercise increases calories burned). What happens when you cannot control your intake? If you over eat, you will get fat (unless you have great metabolism, which some of you have). If you are fat and you overeat, you will become morbidly obese. However, if you get fat, you are also at risk for diabetes, sleep apnea, high blood pressure, joint pains, depression (to name a few), and many other issues, including earlier death. Obesity affects every system in your body and is even associated with a higher risk of some cancers. It is an impressive list of medical diseases to suffer from just because you forget the importance of the calorie! Calorie counting should be tradition. However, most people eventually forget about the importance of calorie control. Obesity is the result of consuming more calories than you burn. Morbid obesity is a disease and an extreme form of this. 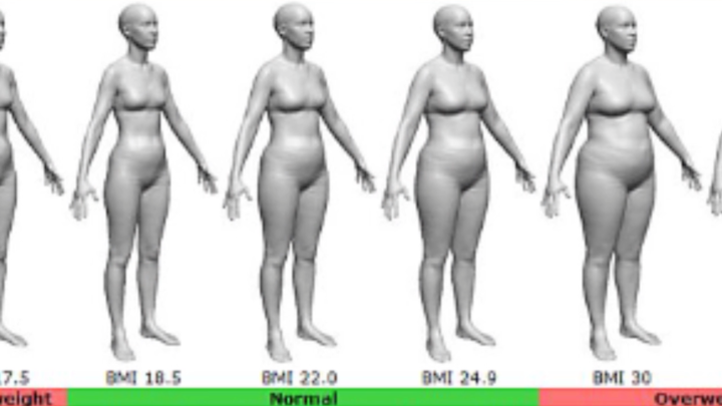 Once you are morbidly obese (over 100 pounds overweight or a body mass index (BMI) greater than 35 kg/m2), the ability to lose weight by pure caloric control diminishes. Many turn to weight loss surgery in this scenario. Our BMI calculator can help you determine if you may be a candidate for weight loss surgery. How do you know if you are overweight? What is your ideal body weight? The first step is to know your height and weight. Then look up the Metropolitan Life table average weights based on height (http://www.bcbst.com/MPManual/HW.htm). Use the numbers listed for the middle bone-frame, take the average of the high and low weight and then that is your “ideal body weight (IBW)”, and then take the difference from that IBW and your actual weight and this is your initial excess weight (iEW). (Example: if the average ideal weight of a female who is 5 foot, 2 inches tall is 124 pounds, then if she weighed 234 pounds, her initial excess weight is 110 pounds. This initial excess weight is really the most important number used to determine your expected weight loss with a diet or weight loss surgery. At a certain BMI (>35), dieting alone becomes very challenging and is often met with weight regain. Weight loss, and weight loss surgery can decrease your risk of diabetes, high blood pressure, depression, and join pains, and can extend your life by years. It truly provides you with a fresh start, and a new way to establish tradition and healthy eating habits. It can help some of you gain that control that you desperately have been trying to obtain. Generally, within a certain average, a band helps people lose approximately 40% of the iEW, a sleeve about 50-60% of iEW, and a gastric bypass up to 75%iEW. A BPDDS can help people lost almost 80-90% of their iEW. The durability of this weight loss depends on many variables, and some people lose less and some people lose more. These averages already assume a patient will be doing some exercise. So what are your choices for weight loss surgery? There are 4 main choices today for weight loss surgery that include 1) the laparoscopic adjustable gastric band (LAGB), 2) the laparoscopic vertical (sleeve) gastrectomy (LSG), 3) the Laparoscopic Roux-en-Y gastric bypass (RYGB), and 4) the biliopancreatic diversion with duodenal switch (BPDDS). All of these procedures can be performed laparoscopically (often confused with the term ‘laser’) which means minimally invasively, through small key-hole sized incisions. Recovery from each is rapid, but they all require general anesthesia and you should consult your surgeon to better understand your risks for undergoing general anesthesia. The surgery with the least immediate risks and the quickest recovery is the LAGB. This operation involves the insertion of an implantable device around the highest part of the stomach. The device is connected to a port that is placed under the skin in your abdominal wall. The port can be accessed by a needle and the band filled with fluid. By filling the band with fluid, it tightens around the stomach, creating the sensation of being full. In addition, the narrow opening does not allow more than a little food in at a time. Thus, by limiting the portion of food consumed, the calories ingested are limited. If the band works, it usually helps the average person lose about 40% of their initial excess weight, but this takes time. Weight loss after a lap band is generally slow paced. At an average speed of ½ to 1 pound a week, to lose 40-50 pounds can take almost one year. So be patient, don’t rush it, and use the band as a tool to limit the number of calories you eat. A word of caution. Overeating with the band can lead to vomiting. The band is NOT designed to make you vomit. If you are vomiting to lose weight, then you are abusing the band and should tell your surgeon. Bands can either erode (get inside the stomach) or slip (move out of position). Both situations require immediate attention. An eroded band may present as an infection at the port site. A slip may present as pain, or weight regain, or even be asymptomatic. All of these complications may require repeat surgery. The port tubing can break, and if so, this will need to be replaced. In addition, a band that is too tight for too long can lead to esophageal distention. This can present as reflux disease, or even as weight regain (the dilated esophagus begins to act as a reservoir for food). If the band is removed, or breaks, almost all patients regain their weight. While there are many patients very satisfied with the band, it requires dedication and routine follow up with your doctor. Bands don’t work alone, they need you to help! Instead of inserting a device to limit caloric intake, the sleeve gastrectomy is an operation where the surgeon actually cuts off and removes about 60% of your stomach. The remaining stomach looks like the shape of a shirt sleeve, thus the nickname. This resection is done over a calibration tube so that the remaining stomach inside of you is about 1.5cm wide, like a narrow tube connecting your esophagus to the end of your stomach. Unlike the gastric bypass, even though stomach is resected, the surgeon still leaves the order of food passage intact from esophagus to stomach to duodenum. Vitamin deficiencies are rare. By removing the bulk of your stomach, you awake from surgery already restricted and without an appetite. Hunger is diminished, and when you do eat, you get full quickly. The weight loss is more rapid than the band, and most patients lose about 3 pounds per week, up to about 50%iEW loss in the first 6-9 months. Afterward, the weight loss plateaus, and some patients will regain their weight. In most centers, a sleeve gastrectomy requires a 1-2 night hospital stay, although some surgeons will try to send you home the same day. This is not advisable. The risks of a sleeve include a bleed (3-5%) or a leak (2-3%) from the staple line breaking down. Both of these risks can happen within the first 2 days, and so you should be carefully monitored during this period of time. Leaks can happen later as well, but are less common. Leaks will require further intervention, and can take over a year to be dealt with and heal. Additionally, many patients (up to 40%) experience reflux (retrosternal burning) after the sleeve but report that it is tolerable with the use of antacid medication. The weight loss observed from the sleeve seems to be better than the weight loss observed from the band at 6 months and at one year. If patients who are successful with a band and those successful with a sleeve are followed long enough, they both do well. Despite these risks, the sleeve is quite popular today, and is sometimes the most common operation performed in many centers. The Roux-en-Y gastric bypass is a more involved operation, but remains the gold standard. While the sleeve gastrectomy is by comparison, an easier procedure to perform, quicker to recover from, and has less overall risks, the RYGB remains the most durable operation. While up to 20% of patients can regain their weight, the average patient will not regain their weight for over 7 years. During a RYGB, your stomach gets cut into two pieces, with the food – receiving portion being the size of a golf- ball. No stomach is removed (like in a sleeve gastrectomy), however, the remnant portion of the stomach stays inside you. The golf-ball sized stomach portion is then connected to the small intestines such that the food you ingest actually bypasses the remnant stomach and beginning of the intestines. It travels about 6 feet before mixing with digestive juices and having the chance to get absorbed. The RYGB takes anywhere from 1-3 hours to perform, and usually requires 2-3 nights in the hospital. There are a number of risks involved including but not limited to a leak and a bleed, as well as the stomach to intestine connection being too tight and causing vomiting early on. This is called stenosis or stricture and sometimes requires an endoscopy to treat. There are a number of other risks, and your surgeon can review all of these with you in detail. The weight loss is rapid as well, with patients losing up to 3-4 pounds / week, to a max of about 75% excess weight loss. Because the stomach is bypassed, you will need to also take calcium and iron pills as these 2 nutrients are normally absorbed high up, and thus can be deficient if not taken after a RYGB. Some patients who do not take their iron become anemic. Others who do not take their calcium can develop osteoporosis. This operation is usually reserved for severe obesity (BMI >60) or for those patients who fail to lose enough weight after a sleeve gastrectomy, or for those who need revisions. It is basically like combining a sleeve gastrectomy with a surgery that diverts the food from the duodenum directly to the end of the intestines such that very little of the ingested calories will get absorbed. Because this is the only truly malabsorptive operation, the weight loss is the most significant, and patients can expect to lose over 75% of their excess weight. It is the most risky operation, with several short and long term complications including leaks, bleeds, and malnutrition from vitamin deficiency. Because patients malabsorb, they can expect increased risk of diarrhea or bowel movement number. Patients need to take vitamin A, D, E, and K, as well as iron and calcium. Patients who undergo a BPDDS must truly comprehend all of the significant changes they will need to endure. If you choose to undergo a BPDDS, make sure you choose a surgeon who performs this procedure regularly. Learn to eat correctly from these operations, after all, these operations do teach tradition. They teach portion control, and thus calorie control. They quite effectively provide you with the ability to decrease your daily caloric intake if you do not abuse it. Like any tradition, once you get the hang of it, it becomes second nature. So will losing weight, and so will maintaining that weight loss. Weight loss surgery will re-teach you the eating habits you once knew long ago, and perhaps you will make these new eating habits tradition. Practice makes perfect, and each of these operations has the ability to help you practice a new eating habit, and provide you with a new beginning and a new chance at life.